TANANA — Nicolas Petit sipped champagne at a candlelit table here Tuesday evening. In front of him, 3,500 one-dollar bills overflowed from a gold pan and plates of food continued to appear filled with Alaska seafood, smoked duck, lamb loin and more. It's his lavish bounty for being the first Iditarod musher to reach the Yukon River. The community here also had a bag of gifts for Petit. The mayor, Donna Folger, and the president of the Tanana Dog Mushing Association, Patrick Moore, presented the Girdwood musher with a beaded Athabascan chief necklace, a mug and a sweatshirt. "Thank you. That's fantastic. I appreciate it," Petit told them inside of the crowded community hall, decorated with colorful lights strung across the walls. "I need a new hoodie because this one is starting to smell bad." 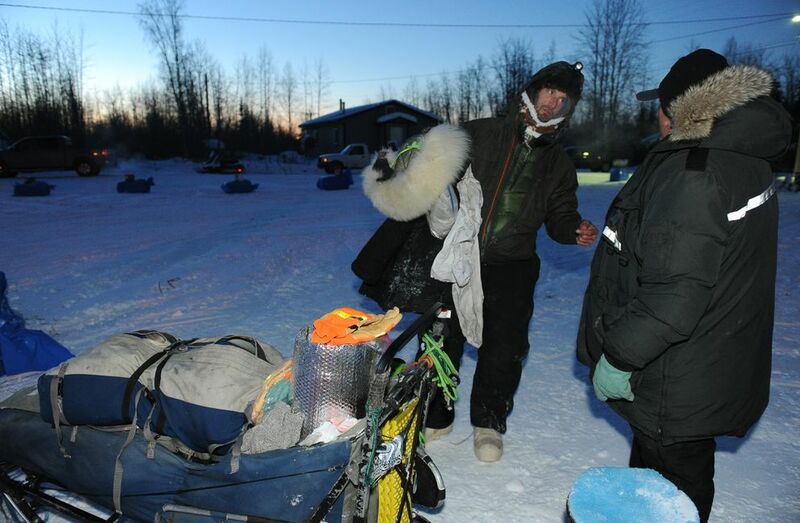 Petit pulled into Tanana with a full team of 16 sled dogs at 6:44 p.m. Tuesday. Petit's two 3-year-old lead dogs, Kristy and Libby, led the way. Petit said the dogs came from a litter named after mushers, including Kristy Berington, a current Iditarod musher, and Libby Riddles, the first woman to win the 1,000-mile race. He described Kristy as "a wild, speed machine." Libby, he said, "sleeps on the bed. She's a little spoiled-rotten child." Thirty-six minutes after Petit arrived, four-time champion Martin Buser reached the checkpoint at 7:20 p.m. At 8 p.m., two-time champ Mitch Seavey arrived in third place, the first of four mushers who arrived in an 11-minute span. While Petit piled straw on his dogs outside before sitting down for his five-course meal, he said he didn't expect to be in the lead. He passed Buser on the trail, while Buser was giving snacks to his dogs, but he said he still expected at least one other team to be ahead of him. 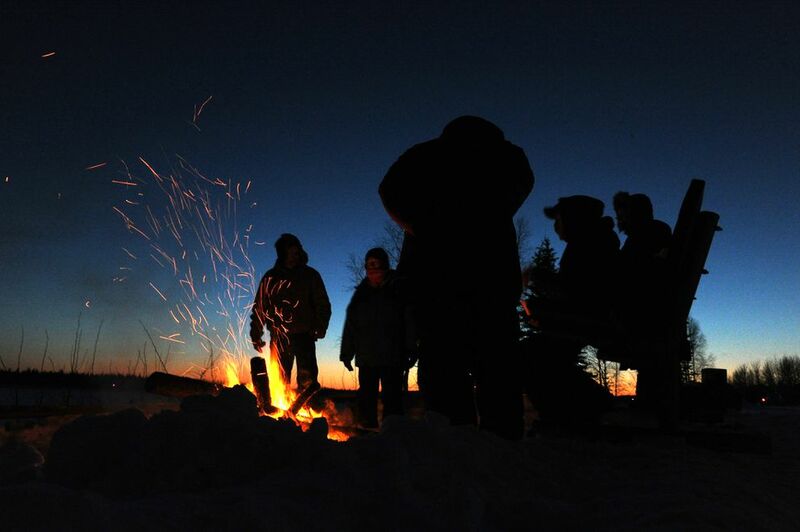 It wasn't until he asked a snowmachiner outside of Tanana about the lineup that he learned of his lead. Petit said "it was an honor to be the first musher to the Yukon." "You get a little extra adrenaline from being out front," he said. "I learned that from Jim Lanier, the guy that got me into this mess. He told me, when I ran his dog team for my first race ever, he said, 'Whatever you do, the further back you are the more sour mushers and more sour dog teams are around. So it's better for my dog team for you to not be toward the back of the pack.' "
This is Petit's seventh Iditarod. He placed seventh last year. Inside the checkpoint Tuesday, Petit asked a resident to eat with him, and the community chose village elder Blanche Edwin. Residents and the media watched and asked questions as the duo dined. Staff from the Lakefront Anchorage hotel cooked the meal on two nearby burners, preparing most of it ahead of time and flying it into the checkpoint in a cooler. Petit said that since he left Fairbanks on Monday, he had eaten doughnuts, a Subway sandwich and "lots of Almond Joys" — so the gourmet dinner was a welcome change. His goal for the rest of the race, he said, "is to keep that dog team beautiful." During dinner, Petit said he didn't yet know how long he would stay in Tanana — it could be anywhere from six to 24 hours, he said. ● Mango sorbet with blood orange gelée.